A very important aspect of every 501(c)(3) nonprofit organization is its transparency into where its funds actually go. The short answer to that question is easy—our beneficiary organization, which in 2018-2019 is Alex’s Lemonade Stand Foundation, and in past years has been the Leukemia & Lymphoma Society, St. Baldrick’s Foundation, and the Pancreatic Cancer Action Network. For our due diligence we have earned the Silver Seal of Transparency from Guidestar for 2018. It is always our goal to pass through as much of the funds donated to Tap Cancer Out as possible through to our beneficiary organization. However, there is an oft-unspoken reality that running a business, even a nonprofit, requires an investment in operating costs. Even for a small nonprofit like us, those costs include merchandise expenses, venue rental fees, mat purchase and storage, a truck and trailer to transport all our equipment from event to event, software subscriptions, paid media (like Facebook Ads), the hosting fees for this website, marketing, travel, and more. These operating costs aren’t solely covered by donations. In fact, we cover as much of them as possible with other revenue streams, namely grants, merchandise sales, registration fees, and spectator fees. Our pass through rates (not to be confused with an “overhead ratio“) can be derived by dividing our Donation to Beneficiary by Total Donations Received. All our financials, including the Form 990 (2012 onward), Statement of Financial Activities (2012 onward), and Annual Reports (published each July, starting with 2014) are publicly available and uploaded for your convenience on our Annual Reports Page. Below are our pass-through rates, including the amount of donations we received and the amount we donated to our beneficiary, on a year-by-year basis. These are added after our books officially close and our taxes have been submitted for the year. This means that in 6 years we’ve required about $0.15 per dollar donated to operate and grow Tap Cancer Out. I am proud of this statistic, but I urge you not to use pass through rate or the amount of revenue spent on overhead to be your sole determinant of the effectiveness of Tap Cancer Out. You’ll notice that we had great pass-through rates early, when we were donating exponentially smaller amounts. If we wanted to continue to donate $50,000 a year, we could do that with greater than a 100% pass-through rate. But if we want to donate 7x that (as we did in 2017), it requires investment in our growth—purchasing equipment, hiring/training staff, generating awareness of our brand and events, and much more—which allow us to host more events and reach more people which in turn allows us to give larger, more impactful gifts to our beneficiaries. It’s not dissimilar to college. Sure, you can avoid student-loan debt by never going to college. But over the long-run, the investment in your college education is likely to lead to a much greater ability to earn. Guidestar provides an insightful perspective on this called The Overhead Myth. We are a small but mighty nonprofit. For our first 7 years of existence we had zero employees. As of 2019 we have one full-time employee and one part-time employee. We run as lean as possible and as we host more tournaments we build the framework to grow our impact exponentially year after year. Cancer affects us all in so many different ways, and there are so many different types that it can become overwhelming. So when we created Tap Cancer Out, we decided that instead of focusing on fighting one type of cancer, we would support a different beneficiary every two years. 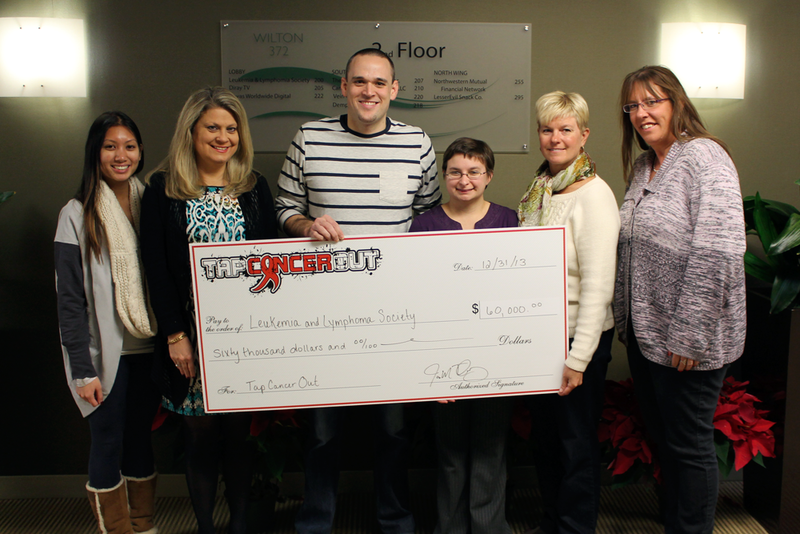 We were honored to work with the Leukemia & Lymphoma Society as our inaugural beneficiary organization. Our donations to both the Connecticut and Massachusetts LLS chapters benefited localized patient support and education. It was important to us to work with the local chapters since our 2012 and 2013 fundraising tournaments took place in Stratford, CT, and Danvers, MA. As a partner of St. Baldrick’s, we had the opportunity to jointly fund four pediatric cancer research grants. The researchers included Dr. Colleen Annesley of Johns Hopkins Hospital in Baltimore, MD, Dr. Jennifer Wu of Boston’s Children’s Hospital in Boston, MA, Dr. Juan Vasquez (as seen in the above video) of Yale University School of Medicine in New Haven, CT, and Dr. Sun Choo of UCSD in San Diego, CA. You can read more about Dr. Annesley and Dr. Wu’s research in our 2014 Annual Report and more about Dr. Choo and Dr. Vasquez’s research in our 2015 Annual Report. We even had the honor of welcoming Dr. Wu at our 2014 Massachusetts BJJ Open and Dr. Choo at our 2016 San Diego BJJ Open to speak to our competitors and volunteers about how their research is helping improve cancer survivorship. Our partnership with the Pancreatic Cancer Action Network started with a simple idea—with a 5-year survival rate under 10% and the third leading cause of cancer-related deaths in the US, pancreatic cancer is “one of the biggest, baddest dudes in the room.” But as BJJ practitioners, who better to fight? In early 2016 we committed to help the Pancreatic Cancer Action Network make significant strides in early detection, treatment, and improving clinical trial opportunities for patients. As part of our partnership, we funded the 2017 Tap Cancer Out – Pancreatic Cancer Action Network Translational Research Grant, which was awarded to Timothy Wang, MD. Dr. Wang is the Silberberg Professor of Medicine, chief of the digestive & liver diseases and director of the gastrointestinal cancer program at Columbia University Medical Center. The Co-principal Investigator is Paul Oberstein, MD, an assistant professor of medicine in the division of hematology/oncology at Columbia University Medical Center. Dr. Wang and Dr. Oberstein’s project is entitled Targeting Cholinergic Receptors to Suppress Pancreatic Cancer and, thanks to Tap Cancer Out and PanCAN, their research will be funded through 2019. Click here to read the full report. If you don’t know who Alex Scott was, you should. Since before her first birthday Alex bravely fought cancer for years, all while raising money at her lemonade stand to help other children fight cancer too. Her spirit inspired many others to set up their own lemonade stands, and before her passing she raised over $1,000,000. Her parents, Liz and Jay Scott, committed to continuing her inspiring legacy through Alex’s Lemonade Stand Foundation. Alex’s story of perseverance and her willingness to refuse to sit on the sidelines, instead figuring out a way (no matter how small it seemed) to fight back against cancer, struck a chord with us for sure.We have some amazing things in store for 2018 and 2019—years which will yield massive growth for Tap Cancer Out. The funds we raise will directly fund ALSF’s Young Investigator Research Projects as well as family services and support, helping families travel to find the best care possible as well as supporting siblings as their family goes through such a trying time. These innovative grant and support programs are designed to fill critical gaps in the childhood cancer landscape.